An excellent, well-rounded, capable super-automatic that offers one-touch convenience and easy clean up. Recommended for: Anyone, but especially those who are new to the world of specialty coffee drinks. Are you new to the world of specialty coffee drinks? Do you have some money to spend, and find yourself in the market for a machine that offers ease of use, convenient, one-touch operation, and enough customization options to make your drink your way, without the need to become a professional Barista? 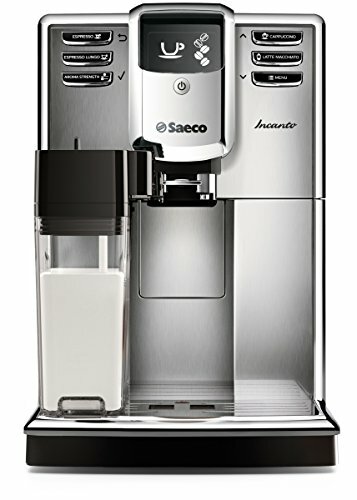 If you answered yes to those questions, then you’re going to love our detailed review of Saeco Incanto HD8917/47 super-automatic espresso machine! In the sections that follow, we’ll go over every feature this mechanical marvel has to offer and outline some of the things it could do better, so you’ll have all the information you need to decide if it’s a good fit for your home, your family, and your lifestyle. While it isn’t a perfect machine, it is a very strong contender, and gives you an incredible amount of functionality for the price! One of the problems that so many machines on the market suffer from today is the fact that they feel like toys. They’re mostly constructed of ABS plastic, and while that’s sturdy enough to stand up to casual use, it also feels a bit like you could break the machine if you so much as look at it the wrong way. While it’s true that the 8917/47 uses plastic in its construction, its front face and top are brushed aluminum with black highlights, and its drip tray is rugged stainless steel. That gives it a heft and sense of permanence that a lot of other models on the market just don’t have. Combine that with its timeless design and European styling, and you get a durable, attractive machine that will make a handsome addition to most any home kitchen. Unfortunately, there’s a catch. This unit is relatively large, with dimensions of 20.6” x 12.3” x 19.5,” so if you have a tiny kitchen or limited counter space, you may struggle to find it a permanent home. If that’s the case, the machine only weighs in at 22.2 pounds, so it’s not a challenge to move it around if you need to. The first question we ask anytime we analyze a new machine is “how big is the water tank?” That matters to us because we’re power coffee drinkers, and have a cup-in-hand just about every waking hour of the day, so bigger is always better in our book. On this front, the Saeco Incanto HD8917, doesn’t disappoint, and our Saeco Incanto review wouldn’t be complete without calling special attention to this feature. The Incanto has an impressive 60.9-ounce, top-loading tank. At that size, it can keep pace with a single power drinker with ease, or support the coffee habit of a large household of casual drinkers, and that’s a very good thing. The Incanto’s water tank was also designed to be fitted with a water filter, and one is included with your purchase of the unit. We’re on the fence where using a water filter is concerned. On the one hand, it’s certainly nice from a maintenance perspective, because, with the filter in place, you’ll virtually eliminate the need to descale your machine. Our problem with it is this: There are other ways to minimize your need to descale. You could use distilled water, or if you’ve already got a filter installed at the tap on your kitchen sink, then adding another one here is redundant. Add to that the fact that they’re expensive, and will significantly increase your total cost of ownership over time, and you see the dilemma. In any case, the filter is included, and if you want to use it, it’s quick and painless to install. Just be aware that you’ll be buying expensive filters on a regular basis, for as long as you own the machine, and factor that into your purchase decision. This is another area that we applaud Phillips for. The grinder is exceptional. Ceramic burr, with six grind settings and an 8.8 ounce, top-loading bean hopper, which gives you the total “Beans to Brew” experience that super-automatics are known for. We love that the company chose to use ceramic, because unfortunately, stainless steel grinders heat up when used, which can burn your grounds and ruin the flavor of whatever coffee drink you’re making. We also love that the bean hopper’s size is well-matched with the size of the water tank. One problem we have noted on some models is that there’s a size mismatch, with some companies pairing large tanks with small hoppers, or vice versa. This increases busywork and forces you to stop at frequent intervals to refill one or both. Happily, you don’t have that issue here. If we have one quibble with the grinder, it would be with the number of grind settings. Six is the industry standard and is certainly acceptable, but finding the proper grind setting for whatever drink you’re making is an essential part of making a great cup of coffee. Given that everyone’s tastes and preferences are different, the more settings you have available, the more you can fine-tune the flavor of your favorite drink. Six is adequate, but if you’re looking for more than just adequate on this front, then you’ll want to look for a different machine. There are models on the market today that offer double, or even triple this number of settings! All things considered though, we rate this as an above average feature implementation. Pro Tip: This isn’t something that’s particular to this model, but holds true for super-automatics in general. They don’t like oily beans, which can clog the grinder. For best results, find a nice medium roast you enjoy and stick with that! Final Note: If you’d rather not use fresh beans, the unit does come with a one-scoop bypass doser, which allows you to use pre-ground coffee. Handy and convenient for those times you just don’t want to go through the whole process, or if you’re looking for a quick cup of decaf in the evening! 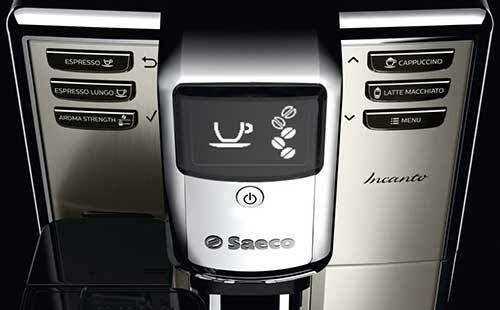 The Saeco Incanto One Touch utilizes a double boiler system. 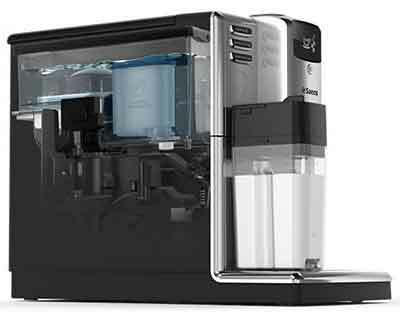 This adds to the cost of the machine, but is also incredibly convenient, because it allows for the simultaneous steaming of milk and brewing of coffee, so there’s no wait while the boiler shifts gears from one task to the other. Both boilers are aluminum and lined with stainless steel, and both feature Thermoblock technology, which allows for rapid heating. We love machines with double boilers, and will happily pay a little more for the added speed and convenience! Most (but not all) super-automatics use a telesco​ping coffee spigot, which is more useful than first meets the eye, and the Saeco Incanto HD8917 is no exception. There are two reasons it’s important. First, from a purely practical perspective, it allows you to adjust the spigot height to accommodate a variety of cup sizes. In this case, the range is from about 2.5” to 6” which is excellent. Second, and this is an important tip for making great coffee, is that you always want to pull the spigot down until it’s just above the lip of whatever cup you’re using. Doing so gives you more crema at the top of the coffee drink you’re making and improves its aesthetic appeal. Another strong feature implementation by Phillips here! These are the most essential components of any super-automatic coffee machine, because the brew unit is the element that makes the coffee magic happen, and the control system is your means of interfacing with it. A lot of companies utilize fixed brew units that can’t be removed. To clean them once a week, you need to use cleansing tablets, then open the machine up and brush it out with a little brush. That’s both annoying and time-consuming. Fortunately, that’s not the case here. 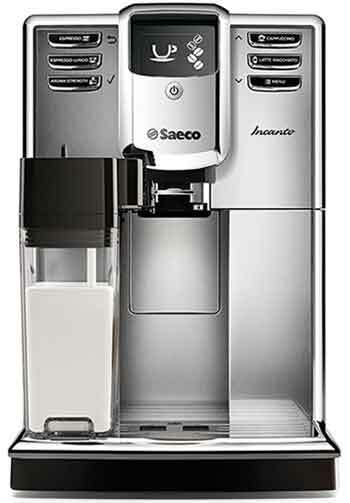 The brew unit on the Saeco Incanto is removable. Just release the safety catch, pull it out, and give it a thorough rinse about once a week and you’re all set. The control panel, located on the front face of the machine, is a combination of a small LCD screen and several push buttons arranged on either side of it. LCD technology is excellent because it makes it possible to create a more complex menu system that’s still easy to navigate. One of the big problems some machines have is their reliance on a small LED strip to convey information. Not only is the information such a screen can convey quite limited, but it also makes menu navigation much harder than it needs to be. That’s not a worry here. The control panel is simple and intuitive. You won’t have any problems navigating to the system settings menu, where you can program your auto-start and auto-shutoff times, nor will you have any trouble finding your way to the maintenance menu, which allows you to handle various bits of automated maintenance. For each coffee drink, you can set the strength of your drink via five different settings (1 = mild, and five = very strong, measured in some number of coffee beans on the display). You can set the amount of water per shot, and for milk-based drinks the amount of foam you want. You can also set the temperature setting (low, medium or high), but here, we recommend just setting this to high and leaving it. The reason for that recommendation is that specialty coffee drinks were designed to be enjoyed at temperatures lower than most Americans like their coffee. As such, choosing the highest temperature gets you closer to temperature of the drip-brew coffee you’re probably enjoying right now. The difference in temperature between specialty drinks and drip-brew coffee is most notable with milk based drinks. This is because milk has to be steamed at temperatures lower than coffee is brewed, and when you mix the two together, you lose heat. We’ll talk about some additional ways around the heat loss problem in a later section, but for the moment, it’s something to be aware of and keep in the back of your mind. If you’ve been in the world of specialty coffee drinks for a while, you’ll already know this, so just skip this section. If you’re researching to buy your very first super-automatic, it’s important to talk about the differences in how drip-brew coffee is made, versus how espresso is made. 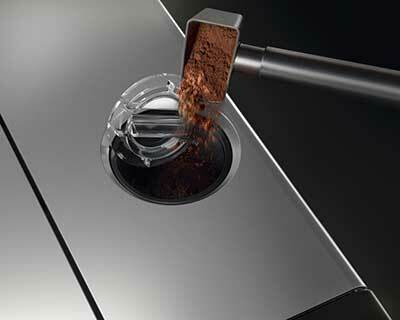 Drip-brew coffee relies on gravity to get the coffee into your waiting pot, and then into your cup. The grounds chamber is flooded with water, which slowly drips down to where it needs to be, a process you’re no doubt familiar with as you wait each morning for that to happen. Espresso is completely different. Brewing espresso relies on pressure, which is measured in bars, with one bar being equal to atmospheric pressure at sea level. It takes at least 9 bars of pressure to make a great shot of espresso, and the pump on the Saeco Incanto is rated fifteen bars. All that to say, you’ll have no trouble getting world class espresso from your machine, every time you order one. That’s important because although specialty coffee drinks may contain a variety of ingredients, the two biggest ones are invariably espresso and milk (steamed or foam). Getting great quality espresso from your machine then is an essential element of making an excellent drink, and that brings us to the next part of our review, the Incanto’s frothing system. Our Saeco Incanto HD8917/47 review would be incomplete if we didn’t call particular attention to this feature. 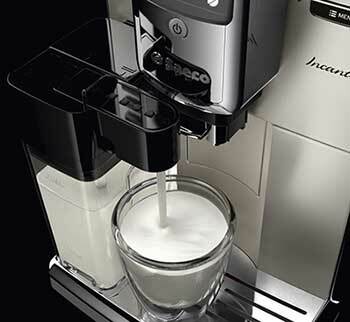 The Incanto uses an auto-frothing system, rather than a steam wand. Purists probably won’t like the model for that reason, but people new to the world of specialty coffee drinks, and individuals who are looking for ease and convenience will appreciate it very much. It’s a good system, and well designed. At the heart of the auto-frother is a durable plastic carafe that’s dishwasher safe, and can be stored in the fridge when not in use. To use it, just put some milk into it, and plug it into the slot designed for it on the machine. The carafe has a slide bar on the top, where the milk spigot is. Just slide that until the spigot is hovering over your cup, and you’re ready to make your drink selection. 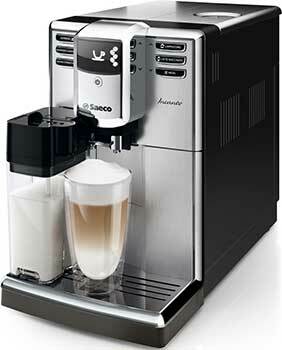 After each milk-based drink you create, the Incanto will prompt you to run a cleaning cycle, and it’s highly recommended that you do so. Not only does this get your machine ready for its next use, but it also prevents milk from spoiling in the tubes that transfer milk from the container to the boiler for heating, then conveys it to your cup. While it’s certainly true that you have less control when using the auto-frother, you do have some (indirect) control from the drink customization menu, which allows you to tweak your milk settings. In any case, the froth that this unit produces is excellent, and for anyone but diehard purists, will be more than satisfactory. We like the system, and consider this to be an excellent feature implementation. Earlier, we made mention of the fact that specialty coffee drinks tend to be somewhat lower temperature than the drip-brew coffee you’re probably used to drinking, and that the temperature difference was even wider where milk-based drinks are concerned. This is true, and the difference in temperature gets wider still when you dispense your drink into a cold cup. Thus, the hidden importance of the cup warming tray, which we regard as the unsung hero of the specialty coffee world. By pre-warming your cup, you minimize heat loss, resulting in a hotter beverage than you’d otherwise have, and the difference is surprising. Try it, and see for yourself. Make your favorite coffee drink, dispensing it into a cold cup. Then make a second cup, dispensing into a pre-warmed cup. You’ll be convinced. All that to say that the Saeco Incanto has a cup warming tray, and once you see how big a difference it makes, you’ll probably use it all the time. There’s a lot to like about the Incanto on this front. The LCD screen makes navigating your way through the menu systems a breeze, and the components that require periodic manual maintenance (drip tray, dregs box, and brew unit) are all easy to access and remove. That said, before you get to the point of enjoying one-touch convenience, there is some setup involved and a slight learning curve. Once you’ve got your preferred drink settings programmed in though, and once you’ve familiarized yourself with basic navigation, it’s smooth sailing from there. This last one is important because each drink can only have one saved customization setting. 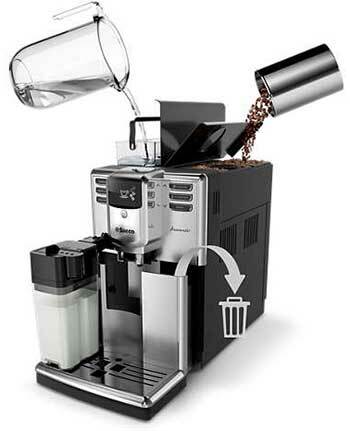 Given the size of the water tank and bean hopper, this machine could easily meet the needs of a large household of casual coffee drinkers, and given that everyone’s tastes and preferences are different, it would be nice to have multiple user profiles, so each member of your family could save their own settings, without overwriting the saved settings of someone else. None of these limitations are absolute deal breakers, except maybe the absence of the frothing wand, and then only for a certain segment of the market, but we feel that these changes would make a great machine even better. 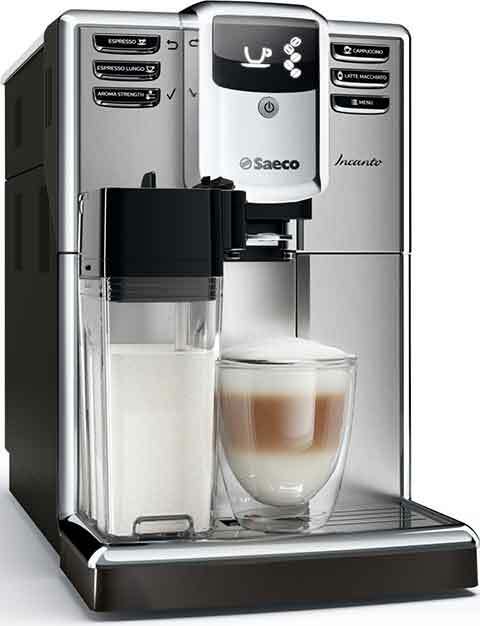 We love the Saeco Incanto HD8917/47 super automatic coffee machine! It’s a great unit, well-built, durable, and loaded with convenience features. In our view, it’s one of the strongest designs on the market today, and we recommend it highly for anyone, but especially for new users and people who don’t mind giving up a bit of fine-grained control for speed and convenience. Saeco Incanto HD8917/47 User Manual. Coffee Rituals: The Addict Versus the Purist? Woodshed Roast. The Milk Frothing Guide. Brewminate.